“Dead Dog” is the oldest MTB trail in Bansko and is a fantastic trail for intermediate riders. The climb up the tarmac to the start of the trail proper is probably the hardest bit but there are plenty of places where the road flattens out so you can rest along the way. Once you are on the trail proper it is a wide rolling path that gently climbs up through the woods. “Dead Dog” is very shady so never gets too hot even in mid summer. Once you get to the highest point of the trail there is a long descent down to the meadows, in some places it is steep and/or narrow so beginners might feel more comfortable walking some short sections. At the bottom when you get to the valley floor you can either turn right for the swimming pool at Dobrinishtay or left for Bansko. For an absolute beginner rider with plenty of rest breaks this trail would take a maximum of 3 hours. For an average rider 1hour 40 minutes. 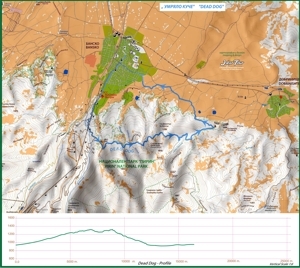 I have added a variation of the Dead Dog course called Dead Dog Long Course it is 23 km and includes some great single track above the village of Dobrinishtay. To join the long course turn right after the downhill section in the first meadow you come to. the path continues east through some dense bushes over a little stream and then up a steep short climb.